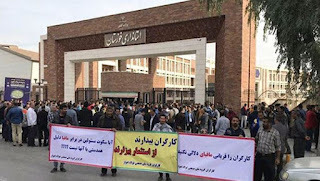 Iran, Dec. 3, 2018 - The workers of Iran National Steel Industrial Group in Ahvaz, Khuzestan province, resumed their protests on Sunday for the 23rd consecutive day. The workers, who had gathered in front of the governor’s office, were chanting, “Inflation, high prices, answer Rouhani!” challenging Iranian regime president Hassan Rouhani on his promises to improve the economic situation. The Iranian regime has tried to dissuade the workers from continuing their protests by different means. The regime security forces arrested several protesters in Shush, also in Khuzestan province, where the workers of Iran’s largest sugar cane factory are holding a similar protest. The regime’s authorities have also issued threats against the protesters and tried to associate them with foreign meddling. On Sunday, the worker of Ahvaz expressed their support for the workers of Haft Tapeh and called for the release of imprisoned workers.